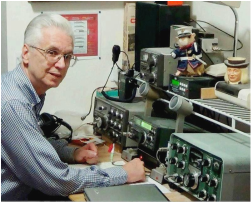 I am a ham radio operator licensed as WB6PUS. I received my Novice license in 1964 and upgraded to General in 1965. Somewhere later on I upgraded to Advanced to get back some of the frequencies that were taken away by the infamous "Incentive Licensing." I live in Phoenix. Unfortunately it is in one of those areas where you are not supposed to put up outside antennas. So, for years I got by with an antenna in my attic. It was the center element out of my old TH3 Jr beam. It didn't do half bad, but getting on 40 and 75 meters was not practical. Then I noticed that a lot of the neightbors had satellite antennas attached to their houses. Clearly "no outside antennas" was not something everyone else was abiding by. So, one December I figured out how to attach a combination 40/75 meter inverted V to the eaves of my two story house. The legs ran to the back yard and when I ran out of room for the 75 meter legs they were turned to begin heading toward each other along the back fence. It worked. The antennas loaded up well and no one complained. In fact, since I was doing it in December, I later found out that at least one neighbor thought it was weird that I was stringing Christmas lights in the back yard. I left the attic antenna in place for the higher bands and then had all HF band capability. Eventually I realized that getting into the attic isn't much fun and I'm not getting any younger (read this as stiffening up). So, I figured it would be a good idea to remove the attic antenna while I could still contort myself sufficiently to do so. If it had been just wire and coax I would have left it, but I didn't want to forever lose that beam center element. The attic entrance is not exactly the easiest entry. You gave to kind for squeeze between some roof supports right at the entry. Getting into the attic one more time was achieved with some groaning and knashing of teeth and I disassembled the TH3jr center element and removed it along with the coax. An hour or so later, covered with dust and coughing because of it, I was done. It was nice knowing I didn't have to go back up there years from now to retrieve that hardware. To cover the higher bands I installed an 18AVTWB retrieved from my parent's house. I put this up on our covered patio with a ground wire but no radials. This went relatively easy, but it clearly didn't work all that great without radials and the patio roof was not exactly big enough for much in the way of radials either. Eventually I found that using a tuner to allow the 75/40 meter inverted V to be used on the higher bands worked as well and sometimes better than the vertical. So, when it started approaching time to replace the roof on the covered patio, down came the vertical (something to store along with the TH3jr in the garage). The other thing that came in real handy was an MFJ autotuner Christmas present in 2011 which would allow easy switching to any band without a lot of manual retuning. This helped in yet another way. For a while now I have been able to operated my Icom 735 remotely with Ham Radio Deluxe and VoIP software. However, tuning an antenna tuner wasn't going to work with this arrangement. The autotuner solved that problem. Now when I switch bands a brief transmission allows the tuner to do its thing and I am ready to go even for remote operation. Oh, if you have looked at the picture above, this is not exactly what you would call a "radio room" or "ham shack." I'm actually in a corner of a walk-in closet. What you see is all the space there is for my radio equipment. Figuring out how to get coax from an interior room with no direct outside access to an external antenna was kind of tricky, but where there is a will there is a way. On the other pages I tell a little about my other activities as well as the activities of my wife, Susan Eickerman.